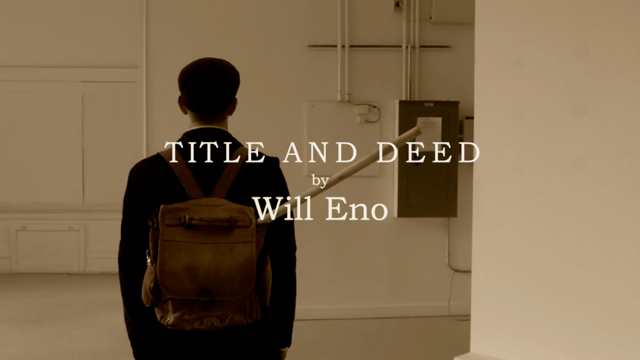 Will Eno has been described as a ‘modern Samuel Beckett,’ and after seeing Nightfall Theatrics’ production of Title and Deed currently onstage at the Tarragon Workspace, I can see why. This is a story about nothing and everything at the same time. It is the existential journey of a man who finds himself out of place not just in a new country, but in his own life, and in the very room in which he speaks to us. The space has been transformed into a living room of sorts, though we never really discover where we are, and the character has a travelling bag, making it unclear if we’re in his home or not. Stanton’s performance, though a bit patchy, is overall very charming. The duration of the show (70 min, give or take) passed quickly, which is always a good sign that the performance is doing something right, and there were many moments in which he connected well with his audience. At other times, it felt like the production was under-rehearsed and under-directed. The writing is witty but complex, and Stanton manages to navigate a demanding text full of nuanced emotions, but I was still left with the feeling that many moments in this story were unmined. He’s got a lot of the individual moments down, but one thing that could be made a bit clearer is why he’s talking to us at all, what does this character want out of this hour? To prove himself? To unburden himself? To simply connect? There is a lot of potential here, and with time and a bit more direction, this show could easily go from good to fantastic.